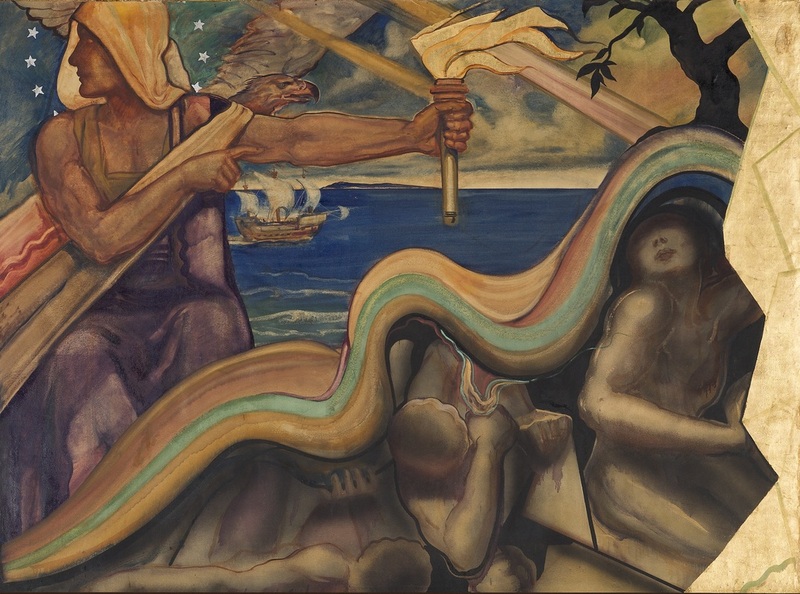 Mural Description From the Lectures of Rabbi Edgar F. Magnin, 1929-1930: "Holding Forth the Torch of Liberty. Stars are clustered around her head. An eagle above her arm. A ship sailing westward toward the New Land. In the year that Jews were exiled from Spain, America was discovered. Bronze figures below the strata of the earth typifying agriculture, mining and the opportunities of the New Land. The earth's forces struggling upward longing to be developed." The expulsion of the Jews from Spain in 1942 coincided with the launch of Columbus' journey and the exploration of the Americas. This began a time of global exploration, and the conquering of new lands and people far from their European homeland. Jews accompanying these voyages settled in the Americas, beginning a new era of Jewish life. 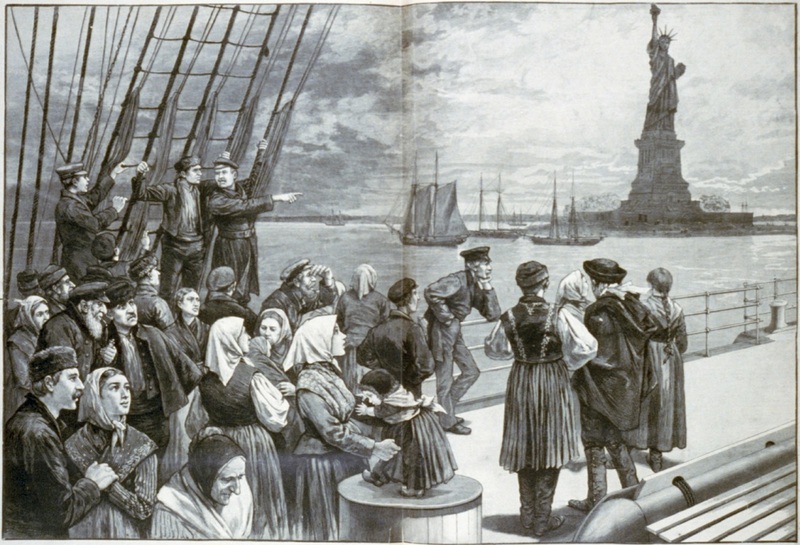 Jewish immigration to America from Western and Eastern Europe and elsewhere came in waves over the succeeding centuries, ultimately making America one of the largest centers of Jewish life in the world, after Israel. If we trace the journeys of our Jewish ancestors, we can discover and understand the experiences and traditions that define our diverse Jewish communities today. How does the fact there are Jews living in different countries throughout the world affect how we understand ourselves as one Jewish people? The Wilshire Boulevard Temple Murals were completed in 1929, before World War 2 and the establishment of the State of Israel. Additionally, there are many chapters of Jewish life that were unable to be included in the mural. In what ways did these profound events impact the journeys our Jewish people continued to make in more modern times? How have these journeys impacted your family? Read in Primary Text: Understanding Jewish History 1, Sol Scharfstein, Ktav, 1996. The Jews Leave Spain, page 160. ﻿"The Inquisition and Expulsion from Spain resulted in the same month in which their Majesties [Ferdinand and Isabella] issued the edict that all Jews should be driven out of the kingdom and its territories, in the same month they gave me the order to undertake with sufficient men my expedition of discovery to the Indies." ﻿So begins Christopher Columbus's diary. The expulsion that Columbus refers to was so cataclysmic an event that ever since, the date 1492 has been almost as important in Jewish history as in American history. On July 30 of that year, the entire Jewish community, some 200,000 people, were expelled from Spain. With the expulsion of Jews from Spain in 1492, and as rulers, borders and economic conditions continued to shift, Jews migrated far and wide. Jews of Spain fled to Portugal, Turkey, North Africa, Italy and throughout Europe and the Arab World. Many conversos also secretly fled to countries where they could reclaim their Judaism without persecution. For four centuries after the expulsion, most Sephardim lived under Turkish rule under the Ottoman empire, which at its height encompassed the lands around the Mediterranean all the way to Arabia and Mesopotamia. 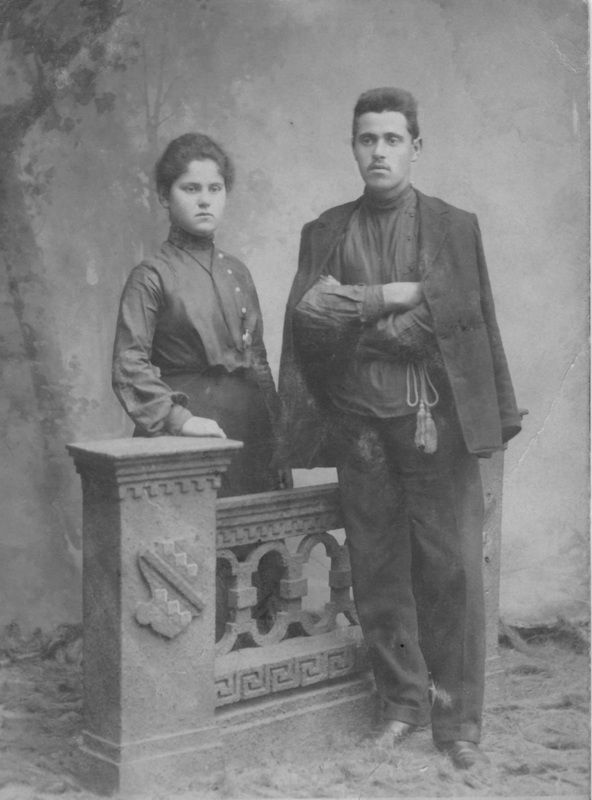 Jews who fled Spain to Portugal experienced more persecution there and began to make their way to Amsterdam, which was more tolerant to the Jews. A time of great exploration, with ships heading off to distant lands, Sephardic Jews living in Amsterdam accompanied Dutch explorers to the East Indies and the Americas. A century later, hundreds of their descendants crossed the ocean to settle in the new Dutch colony of Recife in Brazil, where Jewish communal life became possible for the first time in the New World. When Portugal recaptured this colony in 1654, its Jews scattered. Refugees spread through the Dutch Caribbean, beginning new Jewish communities. A boatload of about 23 Jews sailed into the remote Dutch port of New Amsterdam (now New York) and requested permission to remain. This marked the beginning of Jewish communal life in North America. Jews living in Colonial America were never more than one tenth of one percent of the American population, yet during this time they established patterns of Jewish community life that continued for generations. Most Jews lived in busy port cities like New York and Newport, Rhode Island where people of diverse backgrounds and faiths lived side by side, and there were lots of opportunities for commerce and trade. Many early American Jewish leaders and institutions were both Sephardic and Ashkenazi Jews, primarily from Germany. During this time Jews organized into communities around Synagogues. Savannah, Charleston, Philadelphia, New York, and Newport each had one synagogue that assumed responsibility for the religious and communal needs of all local Jews. This pattern was the case in later years in Los Angeles when B'nai B'rith Synagogue--the first name of Wilshire Boulevard Temple--was established in 1862. Beginning in the 1880's over two million Jewish immigrants came to America from the countries of Eastern Europe. 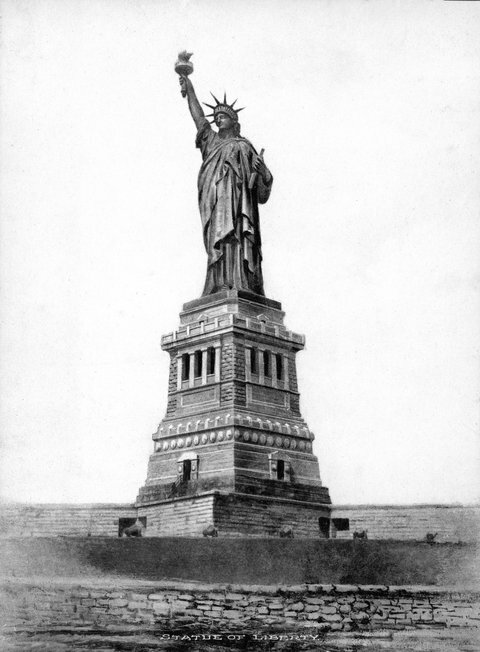 Escaping poverty, anti-semitic violence (pogroms) and seeking new opportunities, most came through New York's Ellis Island, passing the Statue of Liberty as they landed. Background on Emma Lazarus, Writer of "The New Collossus"
One of the descendants of these early Sephardic settlers to New York was Emma Lazarus who in 1863 wrote the powerful and memorable sonnet "The New Colossus", whose lines were proudly engraved on the pedestal of the Statue of Liberty placed in 1903. Emma was the fourth of seven children of Moses Lazarus and Esther Nathan, both Sephardic Jews whose families were originally from Portugal. They had been settled in New York since the colonial period. The Lazarus family traced their ancestry back to America's first Jewish settlers. As descendants of this pioneering group of Sephardic (Spanish and Portuguese) Jews, Emma's family belonged to a distinct Jewish upper class. From them, Emma inherited a rich pride in her Sephardic heritage, and often wrote about the medieval scholars and poets of her ancestors' land. Following the 1881 assassination of Tsar Alexander II in Russia and the political upheaval that followed, mobs of local villagers attacked and murdered their Jewish neighbors in organized attacks called pogroms. As a result of this anti-Semitic violence, thousands of Ashkenazi Jews emigrated from the Russian Pale of Settlement, to New York. More established German Jewish and Sephardic communities in New York looked down upon the new, Yiddish speaking Jewish brethren from "the Old Country." Many of these new immigrants were religious Jews who struggled with the secular world they encountered. Social reformers such as Lazarus began advocating for these Jewish refugees, who came to America with very little. "I lift my lamp beside the golden door!" --Exploring the Poem "The New Colossus"
Project the poem below, use ipads or print out copies for students to quietly read the poem to themselves. Choral read-aloud: divide the class into two groups. Group A reads aloud the first line, Group B the next, alternating through the poem. Encourage students to feel the emotions in each line as they read. Pair students and provide a print out of the poem. Ask students to go over the poem line by line and underline words and terms they do not understand. Use the resources below to view photographs of immigrants coming through Ellis Island, so students can visualize and empathize. Use this interactive word cloud to help in analyzing the poem the New Colossus click here. Some of the explanations may be too sophisticated for your students so review in advance and select those that are grade appropriate. The word cloud was created by Esther Schor, author of Emma Lazarus, a biography published by Nextbook Press and Schocken Books as part of the Jewish Encounters book series. Use this worksheet from Scholastic books on poetic allusions in the New Colossus to dig deeper into the meaning of the poem. After analyzing the poem more deeply have students as a group re-read again the poem out-load to complete the lesson. Staff artist. Illustration in: Frank Leslie's illustrated newspaper, 1887 July 2, pp. 324-325. PBS Documentary "The Jewish Americans (1 & 2): They Came to Stay & A World of Their Own"
to the 3500 years of Jewish history we have explored. Whether your family came to America through Ellis Island in the 1800's, landed before this great influx, or arrived as immigrants in more recent times, America remains one of the largest homes to the Jewish people in the world. While traveling through 3500 years of Jewish history through the Wilshire Boulevard Temple Murals, we have seen the many routes our Jewish ancestors have taken. Today there are over 14 million Jews in the world, with Israel and the United States accounting for 83% of the Jewish population. In this project students will interview family members and collect, interpret and share their family stories, traditions, and heirlooms that have traveled from the four corners of the earth to this place in time, and understand how this collective family folklore enriches who we are as a Jewish community today. There is a folktale passed down through the generations. Before Spanish Jews departed in exile from their beloved homes in Toledo, Cordoba, Granada, they secretly took the key to the front door of their homes, in hopes that one day they would return. It is said these keys lie waiting in the drawers within the homes of Sephardic families today. Is it true? We do not really know-- and folklorists who collect these stories would say it does not matter if it is true. Folktales such as this speak to more than just the facts of history--rather they help us dramatize our lives and unlock a deep yearning, memory and meaning that speaks truth to us-- generations later. As we reflect on the final section of the mural, with the ship heading for America, and the shining torch of possibility-- we encourage you to take a symbolic key and use it to open doors to your family's treasures. As the Jewish story is so long and complex, there are many vital chapters of Jewish life and history that the Ballin Murals were unable to depict. We invite you to discover and share the diverse stories that are unique to your family's journey. Together we will continue where Ballin left off and broaden the story of our Jewish people. "Folklore represents one of the important ways we give life meaning beyond the immediate present. Family Folklorists are Collectors--they ask questions and record the answers, bring stories to light, and gather stuff hidden in drawers that illuminate what is particular about our family journey. To Start Create a Jewish Family Folklore Collectors Kit: assemble a stack of large index cards, six 9x12 manilla envelopes, one composition notebook, box with a lid big enough to hold these items, access to a video recording device on a camera or phone. Create a Family Tree: Use this chart to complete the tree and collect names of family members up until great grandparents. Write in place and date of birth (if known) for each relative. Use this chart to plan which family members you want to speak with. Interview Family Members: With input from parents decide which family members would be best to interview by phone, Skype or in person. Focus on the the oldest relatives whose memory and experience has the farthest reach. Family Tree-- use the form above to document three generations, and plan whom to speak with. Family Stories—the accounts worth remembering about your extended family journey and the different stops along the way. Traditions, Rituals and Customs—the particular ways your family celebrates holidays and special events. Jokes, quotes and proverbs that are repeated over the years. Recipes that are always on the table for family gatherings. Heirlooms—meaningful objects that have been passed down through the generations. Letters, diaries and documents that illuminate your family story. Photographs of your ancestors and significant family moments. FAMILY STORIES: Teach your students techniques for interviewing relatives so they can collect family stories. Use the "How to Interview Well" handout to prepare your students. Conduct a practice interview with the class, interviewing another teacher, school employee or parent. Coach the class on how to formulate good questions, how to listen well and how to ask productive "follow up questions." Ask students to write up three questions which they can use in an interview to gather the information listed on the "What to Collect" list above. After you review and discuss their questions, share some of the questions on this "Collecting Family Stories and Folklore--Questions to Ask" questionnaire. After the in-class practice interview, discuss strategies for video recording and documenting their interviews. Using their phone or camera they can later listen to the interviews later and write down key points to discuss in class. Encourage students to use these interviews to also collect jokes, sayings and proverbs their relatives have repeated over the years. Name of dish or food prepared. Does it have more than one name? If this dish is for a Jewish holiday or special occasion list the occasion(s) when it might be served. How old is the recipe? Where did it come from? How did the person learn to make this recipe? Why is this dish an important one for the family? Portraits that show who was related to who through the generations. Images that show the different places family members lived. 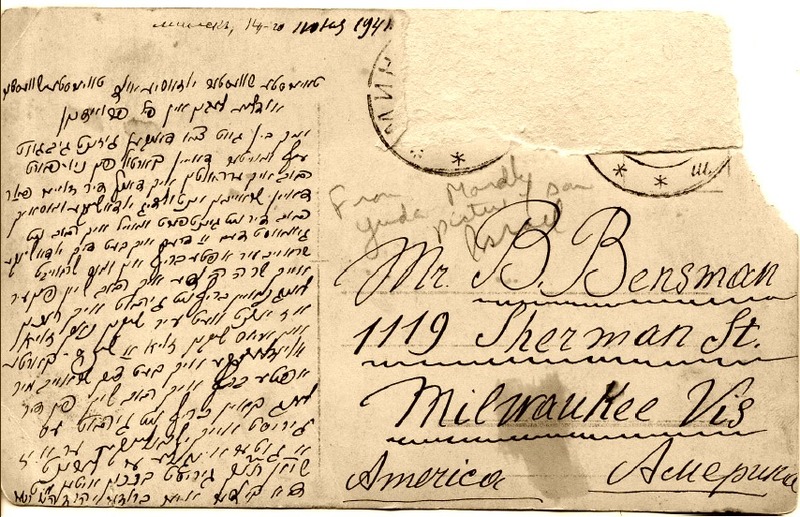 LETTERS, DIARIES AND DOCUMENTS: Ask family members to dig through their drawers and closets and share with you old letters, passports, invitations to family Bar Mitzvahs or weddings. Perhaps there are citizenship papers or newspaper articles, or old postcards in languages from the home country. Maybe there is an old journal or diary or school diploma. Each of these documents holds clues to the past, and tells stories about the family member's life and journey. Photograph what you find and create an archive of important historical family documents. Ask family members to translate the documents if possible and tell you why the documents are important and the memories connected to these items. Create a catalogue of by printing out the images and putting them in a scrapbook with the stories and memories about each item. HEIRLOOMS: meaningful objects that have been passed down through the generations. Are there heirlooms used for Jewish holidays or life cycle events? Find out the history of these objects and the stories behind these family treasures. Write descriptions or imaginary stories about these important and symbolic objects. How do the heirlooms connect past, present, and future? How do they reflect of the family journey and experiences? PRESENTING FAMILY FOLKLORE: To weave together and present the diversity of the American Jewish experience represented in the family folklore collected by the students, select a project below to interpret, share and present. JOURNEY OF AN OBJECT: Have each student select one item they collected and write a story documenting the journey of that object through time and place: all the places it traveled, all the hands who held it, some of the scenes that it may have witnessed. STORY VINE: give each student a 6 foot length of thick rope representing a vine and a length of green floral wire. Students select a series of items they collected that tell story of the meandering journey of one or more members of their family to, or within, America. Make copies of precious items, or quotes from stories heard, and glue them to colored card stock cut into interesting leaf like shapes. Punch holes in each "leaf." Using floral wire connect each leaf to the rope. Intersperse images and explanatory text. Hang a clothesline 7 or 8 feet up across a wall in the classroom and connect the story vines so they hang down and can be shared, intermingled and read. TRADITION TREE: Bring in a substantial. multi-armed tree branch. Using plaster, "plant" it in a metal or clay container. Photograph student heirlooms, mount the images on card stock, have students write about the heirloom on the back and hang the images from the branches, creating a collective "Tradition Tree." JUMPING INSIDE A PHOTO: Ask students to select a old family photo that interests them and write a short story of historical fiction, imagining a day in the life of their relative, in the year the photo was taken, combining fact and fiction. Have students read aloud their stories to each other. Exhibit an 8 x 10 image of the photo and the story side by side. STORY TELLING FEST: Have students select one story told by a relative and prepare the tale for telling aloud. Create a Moth-like performance space for kids. Have the students practice their story-telling skills. Consider these tips from the Moth website: "Have a great first line that sets up the stakes or grabs attention; your last line should be clear in your head before you start; know your story well enough so you can have fun! For the full list of Moth story telling tips (geared for grown-ups) click here. SIMPLE SCRAP BOOKS and FOLKLORE MEMORY BOXES: Set aside classroom time for students to curate their collection of family folklore and select written stories, selection of interviews, photos, images and description of heirlooms, and assemble it in a creative way in a big book or memory box that they embellish with meaningful words and images and maps. SCHOOL TWINNING FAMILY HEIRLOOM EXCHANGE: Classes involved with the L.A. Jewish Federation's Tel Aviv-Los Angeles School Twinning Program can create a book or digital class scrapbook to send to their partner school featuring each students family heirloom and the story that goes with it. Consider the English language level of the students who will be reading it, or write in Hebrew. 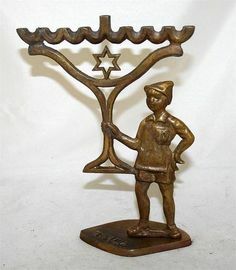 Heirlooms can be an assortment of meaningful objects passed down through the generations or each student can share a photos of their family Hanukkah lamp or Seder plate.